The festival didn’t disappoint – 4 stages, well-spaced out, staggered starting times so you could sample a bit of each stage’s music rather easily, plenty of shade, decent food and beverage options, plenty of water refill stations, and even an arts/crafts area. I went to the concert solo, which didn’t bother me in the least, as my musical tastes tend to stray far from the mainstream crowd, and there aren’t as many folks willing to tag along to see the “weird” bands I like. But I ran into a few folks I knew down there, and they’d ask “Who are you here with?” When I replied, “I’m by myself” they gave me a sad look, like I was Lil’ Orphan Annie or something. Trust me, I like being the lone wolf because then I can just chart my own course over the 3 days and 4 stages, picking out the bands I want to see and flitting from stage to stage like a butterfly on Red Bull. 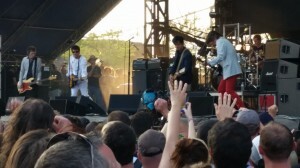 The Replacements did not disappoint, it was great to see Paul and Tommy on stage together. Here’s a nice review with the set list. Dwight Yoakam – fantastic set list, nothing but the hits/favorites, in rapid-fire fashion, which is perfect for the truncated sets that artists get at a festival. Other bands should learn from him. He crushed it out of the park. Lucius – love this band, think their album Wildewoman is one of the best of the past year, and in a live setting they have so much energy and their voices are stellar. Check out the album and then go see them, and thank me later. Spoon – great energy, really looking forward to their new album. Jason Isbell – his most recent album, Southeastern, is one of the best of the past year. Had seen him in Cincinnati but enjoyed seeing him again. Sun Kil Moon – Mark Kozelek’s album’s are definitely “mood” albums and I thought his set would be a bit sleepy but it was quite intriguing. Reignwolf – Has the Hendrix power trio and deep bluesy voice thing down pat. Played on the smallest stage but had the crowd screaming for an encore by the end. The Districts – a Philly band I had only heard one song from, they really rocked. Mt. Moriah – another band I didn’t know much about going in, definitely worth checking out. I’m already looking forward to next year’s Forecastle. If the lineup is half as good, it’ll still be worthwhile. Bob Mould has had quite a career in the music business – and it ain’t over yet! He recently released a new album called Beauty and Ruin on the fantastic Merge Records label (run by Mac and Laura from Superchunk). Earlier this year he celebrated the 25th anniversary of his first solo album Workbook. Which means it’s been 25 years since I saw Bob at my first non-arena concert… seems like yesterday. Bob started the show the same way the Workbook album started, playing the gentle instrumental “Sunspots.” The stage was completely dark. Then Bob and the band segued into the more raucous “Wishing Well” as the stage lights came up. I was shocked, stunned, aghast… I’d never seen so much raw energy from a band before. Some of that was due to the fact that the only other shows I’d seen were arena rock shows where I was miles from the stage, but more of it was due to Bob’s in-your-face punk approach to playing and singing. So 25 years later, I’d like to thank Mr. Mould for showing me a whole new kind of live music.